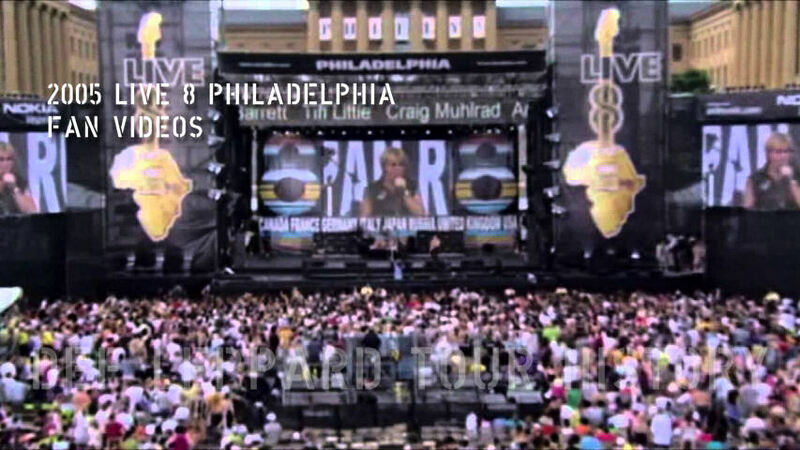 Def Leppard played the Live 8 show in Philadelphia, PA on this day in 2005 and photos/video are available. 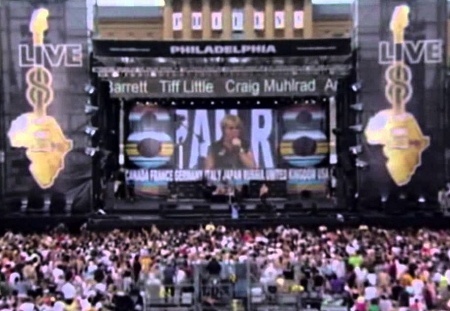 The show took place in front of the Museum Of Art in Philadelphia, PA.
Part of the 'Live 8 The Long Walk To Freedom' series of concerts that happened around the time of the G8 conference of world leaders in Scotland with a view to influence them to tackle world poverty issues. The US event was attended by over 1 million people making it the largest audience the band have ever played in front of. A series of free concert events took place in London, England, Philadelphia, PA, Berlin, Germany and Barrie, ON as well as Chiba, Johannesburg, Moscow, Cornwall and Edinburgh. The event was organised by Live Aid founder Bob Geldof and announced on 31st May with Def Leppard's involvement confirmed at a later date. The Rock Of Ages tour with Bryan Adams had started on 1st June 2005 at PGE Park in Portland, OR. The band had had to turn down the offer to appear at the original Live Aid show 20 years before in July 1985 due to Rick's ongoing recovery from his accident. They had travelled to Philadelphia on 1st July to attend rehearsals before playing a show with Bryan Adams in Camden, NJ. A show that had to be cancelled after soundcheck due to storm damage to the stage. Three songs were performed at the Live 8 event - 'Rock Of Ages', 'No Matter What' and 'Pour Some Sugar On Me'. The bill for the USA show also included Bon Jovi, Rob Thomas, Maroon 5, Linkin Park, Keith Urban and Stevie Wonder. In a busy and hectic two days the band travelled on to Lancaster, PA after this performance to play another show with Bryan on the Rock And Roll Double Header baseball stadium tour. Bryan himself travelled to Ontario, Canada to play at the Canadian event. 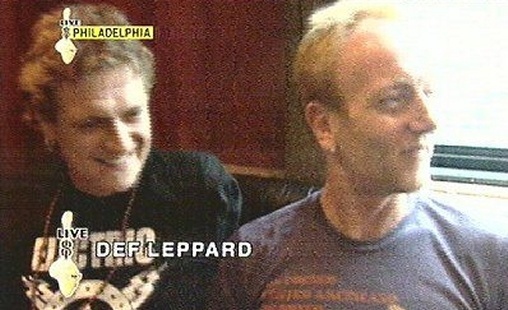 The show was streamed live online by AOL and Def Leppard's performance was shown live on the BBC's Interactive channel. ROA and PSSOM were also later shown as part of BBC1's late night coverage of the event which also included an interview with Rick and Phil. "I'm just getting the message, It's official, from the mayor of Philadelphia, that there are over 1 million people out there." Graham Norton - I think the line up here, it's mixed there's everything. There's Stevie Wonder, there's Jay-Z, there's Sarah Mclachlan there's yourselves. So as kind of like 'heavy metal' do you kind of like choose a setlist that is a little easier going? Phil Collen - Well, we're not really heavy metal are we. We're a rock band. Graham Norton - Well it sounds quite heavy to me. Phil Collen - No, no, no. We're pretty mild in today's - you know. Graham Norton - Def Leppard! Rick Allen - You know what I think the important thing is. Is that you know as musicians to us there's good music and there's bad music. And really you look at Phil's record collection, and I'm sure look at your record collection, whatever, It's just everything, Everything there is. And I think the most important thing about what's going on tomorrow is the fact that everybody's intention is in the right place and as long as that happens this is gonna be a success." Joe Elliott - "I think, first and foremost, we've got to realize that it's all for a good cause, and that is the primary objective, is to raise awareness of what's actually happening in Africa. But at that moment in time, people are gonna be celebrating what's actually happening on, on the stages. People are gonna be tuned in all over the world, watching artists from all over the world doing what they do best, and hopefully raising awareness for what is an extremely serious situation that needs fixing yesterday." Phil Collen - "It should be a no-brainer that people shouldn't be starving. It's ridiculous." On Geldof, Collen said: "It's really great that someone has the balls and the compassion to get it together, who wouldn't want to be a part of that?" 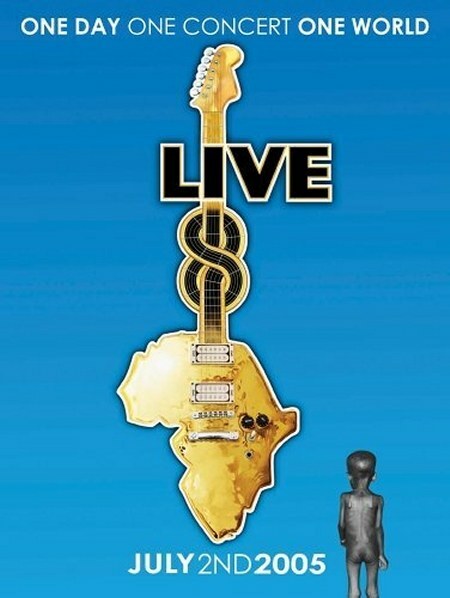 (On missing Live Aid in 1985) - "We were initially asked to do the original one 20 years ago. Unfortunately, it fell about four months after Rick Allen lost his arm. So we, we - his recovery hadn't happened, and we weren't...no way were we gonna to do it with a, a different drummer, you know, so we had to pass on it." View videos from the show on this YouTube playlist.